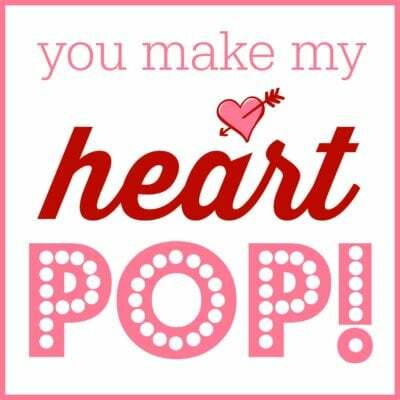 Valentine popcorn lollipops + free printable! These are so easy and fun to make, and they are always popular wherever we take them. They’re made with melted marshmallow–so like a Rice Krispie treat but using popcorn instead! I tinted them pink, and I like the extra color it gives them for the Valentine holiday. Next their dipped in white chocolate, with generous sprinkles on top, and they’re ready to go! You can make them and serve them at home, for a party, or wrap them up for the classroom. They make darling gifts, and would be super cute as a Valentine! I’ve included a cute printable just in case! Place a clear plastic treat bag over the top of the popcorn lollipop, then tie a ribbon around the stick. Punch a hole in the printable, then thread it onto the ribbon. Let the mixture sit for about 5-10 minutes, to let the marshmallow cool--but not harden. Coat your hands with butter, then form the popcorn mixture into firm balls. Place them on a piece of wax paper that has also been rubbed with a little butter. Don't use cooking spray--it leaves a yucky taste on the popcorn. Delicious! Thanks for sharing and for the cute free printable. I’ve added your recipe to my Valentine’s Day Treats roundup :) Happy Wednesday! Thank you!! I would say at least a day or two. I would cover them in a plastic treat bag, so air can’t get to them, or they’ll get too soft. Did you tint the marshmallow mixture pink?